The Week in Wrestling takes a look at the run up to this year’s WrestleMania in Dallas. SI.com’s Wrestling Week in Review is published every Wednesday and provides beneath the surface coverage of the business of pro wrestling. Vince McMahon knows how to deliver at WrestleMania. Yet he is entering unknown territory this Sunday with the Roman Reigns predicament. Reigns’ booking has been a disaster for the past two years, and there is no way to put him over in the main event of the biggest pay per view of the year. McMahon threw a swerve last year with Seth Rollins cashing in “Money the Bank” contract, but no such backup plan exists for this weekend. The Rock is promising a surprise of epic proportions for Sunday. Is it possible–in a scene out of WrestleMania IX–that Triple H defeats Reigns, mocks the crowd/claims he is the greatest champion of all time, only to be challenged by the People’s Champ? ESPN is giving unprecedented coverage to WrestleMania, and concluding the “Showcase of Immortals” with Dwayne Johnson as champion would be money for Monday morning headlines. It also provokes a Reigns heel turn, perhaps even as soon as the following night. Or… based on the finish of Raw, Roman Reigns can overcome all odds to defeat Triple H. If that is the case, we will soon find out if there is enough pyro in Arlington, Texas to drown out 100,000 boos. Shane McMahon finally hit his stride on Raw. The delivery of his “You stole this company from your father–this Sunday, I’m taking it from you” line blurred the lines of reality as many older WWWF veterans felt that Vince made a mockery of his father’s Northeast wrestling dynasty. The 46-year-old Shane was blown up after five minutes of brawling with the Undertaker, and I am expecting a match full of high spots in the cage and plenty of outside interference on Sunday. • Sports Illustrated will be delivering a running blog from the Lone Star state throughout WrestleMania weekend. There will be coverage from Ring of Honor, Evolve, the WrestleCon Supershow, Shimmer and a WrestleMania review on Monday. In addition, there will be a feature story this Friday on Evolve’s Gabe Sapolsky. • The most memorable match from WrestleMania 32 will be Brock Lesnar defeating Dean Ambrose. Lesnar is still the most destructive force in wrestling, and Ambrose is hungry to deliver spectacular matches en route to his first run as WWE world champion. • Will WrestleMania 32 open with Steve Austin, The Rock and John Cena in a segment similar to the one we watched at WrestleMania 30? The Rock will likely be inserted into the main event, and a spear/heel turn for Reigns would make for a memorable ‘Mania moment. • Soon-to-be Hall of Famer Michael Hayes produced a solid two-part segment between the Dudley’s and Roman Reigns, which began on Smackdown and finished with Triple H on Raw. • Revolution Pro Wrestling just announced Zack Sabre Jr.’s next title defense on June 12 in London against Kurt Angle. Although Angle was offered a part-time wrestling/coaching contract from TNA, the return to the independents is a far better route to lead to an appearance at WrestleMania 33. • Count me among those who hope the Zack Ryder push extends beyond WrestleMania. While I not optimistic that it will last beyond this Sunday (especially considering he immediately took a Codebreaker after upsetting Chris Jericho on Raw), Ryder is talented in the ring and strong on the mic. Given the opportunity, he and Kevin Owens would put together a very good series of matches. • Brock Lesnar is considered somewhat of a mercenary in wrestling. He does not follow the company line and say he grew up dreaming of headlining WrestleMania or even becoming a WWE superstar, so it was interesting to hear Drew Galloway remark that Lesnar was one of the people who questioned his decision to join 3MB. “I remember Brock Lesnar walked up and said to me, ‘Why are you doing this?’” said Galloway. Nice to see that Lesnar cared enough to ask why the 6’6”, 240-pound Galloway was relegated to a comedic heel trio. • Very quietly, Ric Flair has transformed into one of the best managers in the business. The “Nature Boy” will forget more about wrestling than most of us will ever learn, and he has found new life managing his daughter. Flair never steals the spotlight, and has only enhanced Charlotte’s run as a heel. • Twelve matches at WrestleMania is a significant accomplishment for Chris Jericho, but it will be a long time before Shawn Michaels is ever replaced as “Mr. WrestleMania.” But who is the original Mr. WrestleMania? Before Michaels claimed the title, I would rank Randy Savage–who had ‘Mania moments with Ricky Steamboat, Ted DiBiase, Hulk Hogan, Dusty Rhodes, the Ultimate Warrior, and Ric Flair–as the original holder of that prestigious title. • Curtis Axel briefly mentioned, “Happy birthday, Dad” on Raw to his late father, Curt “Mr. Perfect” Hennig, who passed away thirteen years ago. Mr. Perfect was the prototype for a cocky, talented heel, and it is unfortunate that Axel continues to be marketed in the same fashion when he would connect far better with viewers as the underdog. • The League of Nations should be involved in the Andre the Giant Memorial Battle Royal, and the Wyatt Family–even riddled with injuries–would have added a tremendous amount of excitement to a dull series between New Day and the League of Nations. On the bright side, maybe the LON will cease to exist after WrestleMania. • Ring of Honor’s four-way tag match–between the Young Bucks, Addiction, the Briscoes and the Motor City Machine Guns–on Saturday afternoon has the potential to be the match of the weekend. • What is worse–the Total Divas show… or matches on Raw which tie in storylines from Total Divas? KO-Mania has to retain the Intercontinental title in the 7-man ladder match, right? Right? I am looking forward to a transcendent performance from Owens, who understands the enormity of what is at stake this Sunday. Two very different points in their careers, but I recently re-watched Goldust vs. Roddy Piper in a Hollywood Backlot Brawl. Piper was 41 by this point, while Ambrose is only 30, but if the “Lunatic Fringe” can tap into Piper’s wheelhouse against an all-time great in Lesnar, we’ll have the match of the night. I hate to set the bar too high, but I think the template for Styles-Jericho is the WrestleMania 22 classic between Shawn Michaels and Chris Jericho. Can these two deliver? Will Lesnar be reinserted to the title picture after Sunday? Or will his feud with Ambrose be extended? Jericho has been superb in the Rumble-to-WrestleMania stretch, and I am very excited to see what he has in store for his next feud (Shinsuke Nakamura?) after Sunday. Unless Reigns turns heel, the finish of WrestleMania is going to be a disaster. Omega returns to action in a 10-man tag this Friday as he teams with Bullet Club members Tama Tonga, Bad Luck Fale, Tanga Roa and Yujiro Takahashi against Hiroshi Tanahashi, Michael Elgin, Juice Robinson, Tomoaki Honma and Togi Makabe. The Ring of Honor world champion defends his title against Top Prospect Tournament winner Lio Rush on Friday in Dallas. The IWGP champion returns to six man tag action tonight, Friday, and Saturday–will Okada find time to watch former rival Shinsuke Nakamura debut at NXT on Friday? Surprised that Charlotte was booked against Becky Lynch on Monday, but looking forward to seeing what she has in store for Sunday. Although Sasha Banks is the favorite to win the title, Charlotte–despite a slow start–has thrived in her role as heel champion. Ring of Honor’s Albert C. Hardie, Jr.–known in the ring as ACH–is one of the top high flyers in the business. The 28-year-old already has ten years of experience in the ring, and he is, both literally and figuratively, one of ROH’s rising stars. SI.com: You have put so much work into your career to reach this point of success in Ring of Honor. What has allowed you to succeed, and were you nervous that you did not have a backup plan in case of failure? ACH: It’s taken a lot of bumps and a lot of bruises to get this far. It takes a lot of sacrifice to be successful. With me, it’s been a constant struggle trying to find who I am as a person. I got in when I was 18 and fresh out of high school. I grew up in Austin, Texas, and I went against the grain. People wanted me to get an education, and I’m not against that at all, but I always believed that if I ever gave myself a backup plan, I was telling myself there was a possibility that I wouldn’t make it. Failure was not an option. I actually just moved back to Austin after living in St. Louis for the past four years. I’ve had to mature a lot to come this far in the business. It’s a small window, and only a few people can fit through. I’ve just been grinding and believe that hard work pays off. SI.com: In today’s era of wrestling, dives are overdone in the same fashion that blood gushed in matches throughout the late 90’s. How did you make your dive–the breathtaking “Air Jordan”–so unique? ACH: The dive is actually a luchador dive and the inventor was Aero Star from AAA. I wanted to add my own touch, so I call it the “Air Jordan.” One thing I have over a lot of wrestlers is my imagination. I always try to add that flavor to it, and the step up dive is a good example of that. Aero Star never spread eagle in the air, but I live in the moment. If I skydive, I’m not going to just jump off the plane. So I spread eagle, and it reminded of Jordan’s “Rock the Cradle” dunk, so I looked at it as a game-changer like Michael Jordan. That’s why it is so cool to share the ring with someone with an imagination like Kenny Omega. He would do the hadouken and all the Street Fighter stuff, and he always expressed himself through his own outlets. I love being myself in the ring. So to be at this point in my career, and face guys like Alex Shelley, Matt Sydal, Kenny Omega and Shinsuke Nakamura, it’s mind-blowing. SI.com: Who are the top three wrestlers in the business? ACH: The best three in the business has to be Okada, Finn Balor, you always have to mention AJ Styles, he’s basically the godfather. There are so many great guys in the business. Hate him or love him, but I think Roman Reigns is really good. He’s making top dollar for a reason. Nakamura, Kenny Omega, you can’t even neglect the Bucks, reDRagon and the whole NXT is killing it, our roster, the PWG roster, Kevin Owens. Wrestling as a whole is just killing it. I’m proud to be a pro wrestler. SI.com: You have yet to win gold in Ring of Honor. Is that a goal of yours for 2016? ACH: I want it all. I’d love the IWGP Junior Heavyweight Championship and the Ring of Honor Television title. At some point–and why not?–I want the Ring of Honor championship. My childlike exuberance comes alive out in the ring, I work very hard, and a title would put the stamp of approval on how hard I’ve worked. Titles can be props, but they do have meaning. It shows people that you’ve worked hard enough to the point where a company is going to put its trust and faith in you. SI.com: What is the most important piece of your character in the ring? ACH: I represent being yourself. I don’t talk about expressing yourself, I just do it. It’s a good feeling when you walk out to the crowd and feel like you’re wrestling in front of friends and family versus wrestling in front of fans. It makes the connection that much deeper and that much better. When you’re around your family, you’re yourself. When I can look at the people in the audience as my friends and family, it makes my performance that much better. The Honky Tonk Man–the longest reigning Intercontinental champion of all time–has officially given his stamp of approval to Kevin Owens. The 63-year-old Honky Tonk Man–whose real name is Wayne Farris–remains a part of wrestling’s independent scene in grassroots America, but a discussion of the IC title naturally brought him back in time to 1987. Ricky “The Dragon” Steamboat defeated the “Macho Man” Randy Savage for the company’s number two title at WrestleMania III, but Steamboat informed Vince McMahon shortly after the victory that he needed time off to be with his wife and newborn son. Part of the allure of the Honky Tonk Man was the “Mouth of the South” Jimmy Hart by his side. In addition to Hart, Honky’s traveling crew during his days as champ were Dave and Earl Hebner. The most memorable moments of Honky’s career include smashing Jake “The Snake” Roberts and Savage over the head with his signature guitar, as well as dropping the IC title to the Ultimate Warrior at the 1988 SummerSlam. The Honky Tonk Man was scheduled to defend the Intercontinental title against Brutus “The Barber” Beefcake, but a storyline injury allowed the Ultimate Warrior to take his place and win the title in just thirty-one seconds. Though all parties were pleased with the Warrior’s rub at SummerSlam, the damage was already done. Issues between Farris and McMahon arose when McMahon wanted Savage to win the IC title months before, and McMahon has a long memory. 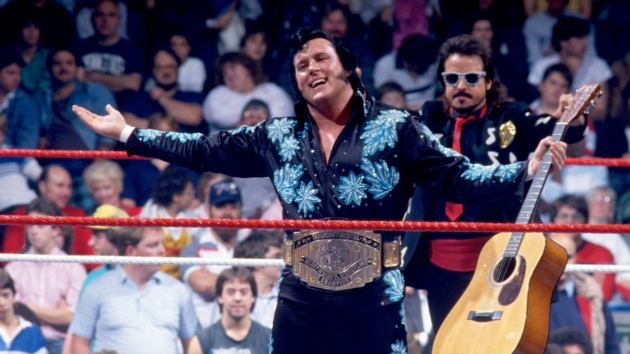 Amazingly, the Honky Tonk Man does not occupy a spot in the WWE Hall of Fame. He was, however, offered the chance to be enshrined in 2010 during WrestleMania XXVI weekend. “They offered the Hall of Fame when they were in Phoenix, but I was contracted to go to Wizard World of Comic Con,” said Farris. “I went to Toronto instead, and I don’t think they liked me doing that. But if I had a contract with them, they would want me to honor it, and I had a contract that I honored. Back then, there was also a no-compete clause for 90 days after you were inducted in the Hall of Fame, and I needed to work. Farris appeared as a new character on WWF programming in 1986, but was already a nine-year veteran by the time his introductory “Vote of Confidence” vignettes with Jesse “The Body” Ventura began to air. Before wrestling, Farris was coaching football and teaching civics, economics, and geography in West Tennessee. “My plan was to give wrestling five years, and see what happened,” said Farris. “If nothing came out of it, I would go back to teaching and coaching. Those first five years went well, so I thought, ‘OK, I’ll give it five more.’ I really did have a five-year plan every five years, and then finally, I lost count. In addition to a place in the history books, the run as Intercontinental champion also gave Farris an introduction to how McMahon’s pay scale operated. “With no formal contracts and no guaranteed money, there was a big pay discrepancy between the bottom of the card, the middle of the card, and the top of the card,” explained Farris. “When I first started underneath on the card, I was doing $2500-$3000 a week. People thought that was pretty good money, but I’m paying my hotels, food, and rental cars, so there’s not a lot left when I paid my taxes. I was making that much teaching school. Then you get to the middle of the card, and it goes up another $1500-$2000. The top of the card–headlining Madison Square Garden with Bruno [Sammartino]–had you making $10,000 for one match, so you always want to be on top of the card. Farris has known Terry Bollea for over forty years, and watched the Hogan-Gawker trial with great interest. Farris also expressed his gratitude for the people who have supported him for decades. JTG and Shad Gaspard have dream matches in mind for Cryme Tyme at WrestleMania 32. 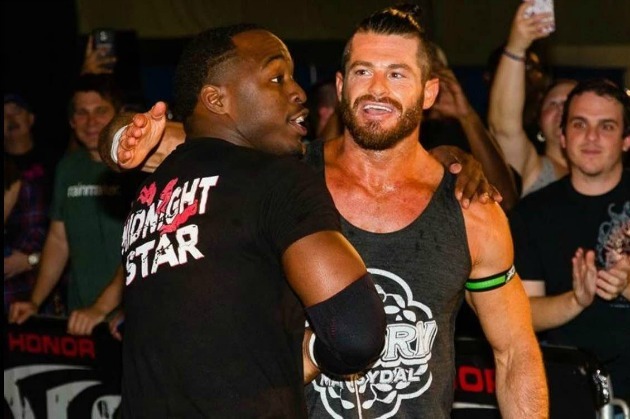 Both agreed that a series with the New Day would be compelling, Gaspard wants another team if he ever returns to WWE. Both JTG and Gaspard complimented the New Day for making their gimmick work. “And that’s what New Day did,” added JTG. The rich history of the WWE title includes only one African-American champion, and Gaspard once had designs on the world title. Gaspard explained that Shawn Michaels represented one of the stoppers of Cryme Tyme’s success. “I idolized Shawn Michaels, but he had our back to our face,” said Gaspard. “Away from us, he didn’t. In addition to a friend of both Gaspard and JTG, former WWE tag team champion Lance Cade was a student of Shawn Michaels. Unfortunately, the late Cade, who passed away at the age of 30 in 2010, was unable to please his teacher. “I loved Lance Cade,” said Gaspard. “He was my friend in OVW, and he was a guy who always upbeat and happy. But when Lance got around Shawn, nothing he did was right. It breaks my heart. That’s a guy who really tried his f----- his a-- off. 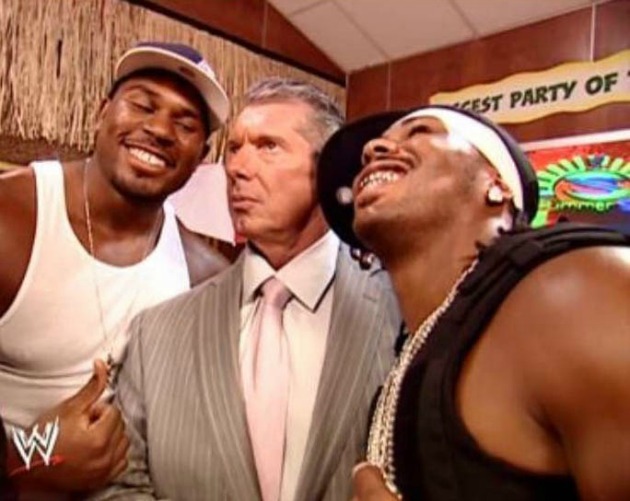 A major reason Cryme Tyme is unlikely to return to WWE is their confidence and honesty. Gaspard agreed that he is not optimistic for a return solely on the WWE’s terms. Even without a return any time soon, there will always be fond memories of the Cryme Tyme every time they turn on WWE television, especially Kofi Kingston. “I beat the s--- out of Kofi Kingston in his tryout match,” said Gaspard. “He still has a scar from it. I also made him look like a million bucks. I threw Kofi so high in the air that he fell in my face, and when he drop kicked me, I sold got him. I said, ‘Hit me as hard you can, please.’ He survived, and then he got signed. He belonged. The Mat Mania album would not be complete without a track featuring Vincent Kennedy McMahon. McMahon, Mega Ran remarked, has found innovative ways to keep his character fresh for the past twenty years. Mega Ran, who officially released the complete Mat Mania album today, is about to enter a busy WrestleMania weekend. He is podcasting from 9am-5pm on Friday at WrestleCon, and he will be shooting live episodes and delivering a plethora of surprise guests. He is also performing in the ring at Kaiju Big Battle on Friday night, followed by a Mat Mania Release Show on Saturday at 9pm at Caves Lounge in Arlington. New York Stock Exchange? They’re home. Justin Barrasso can be reached at JBarrasso@gmail.com. Follow him on Twitter @JustinBarrasso.